For What it is Worth: We are buying Gold in our small family fund. This is a trade, not an investment. Potentially a much longer term trade for us than normal, possibly a 12 month hold as opposed to our 3 day positions. We are buying physical in quantities that will not need to be sold if we are wrong, thus no leverage. We will also be swing trading gold with an upward bias as our indicators dictate below $1260 or above $1306. Target picking is risky in an asset whose value is largely based on sentiment and prone to being "jawboned" into its proper place. But we believe for various reasons that if Gold does not pierce $1260 spot, its chances of a rally topping between $1450 and $1700 are strong over the next 12-18 months. The wide target range reflects the emotional factor in Gold's behavior far outweighing supply, production costs, and its lack of fundamentals to measure using tools like EBITDA, PE, and cash flows. And our own analysis is corroborated from several different disciplines who we did not seek out to rationalize our own bias. Those analysts we respect have a collective range as high as $1850 with downside risk to $1135. We'd be happy to sell at $1650 if we are right. For us, it's just a trade. But it's a very good and very rare risk/reward trade. It has set up right now. Further, it will either be violently and decisively confirmed (or negated) above $1306 or below $1260 not in that order. And holding an asset for 18 months is not an investment by our standards. Please get off our lawn if you think it is! 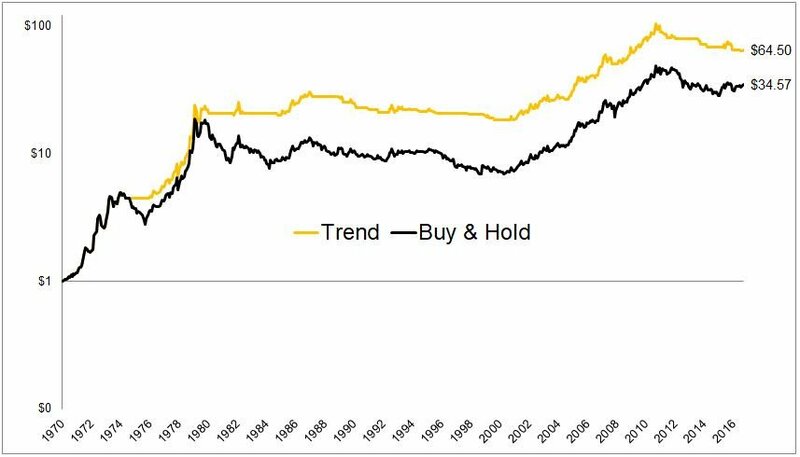 Trading Gold Long Term is Not Investing. Buy and Hold vs. Using a “Go to Cash” Filter is key in treating Gold as a trading vehicle and not an investment. It stores wealth, it isn’t a growth or income vehicle. Why are we sharing this? That same question should be asked of Ray Dalio, Jeff Gundlach and others who announce they are bullish on Gold after they have bought. Our own position is not relevant to the market overall and we do not need to market our tiny positions to create an exit strategy a la George Soros. The premise for the trade happens so rarely its worth writing about, if for no other reason as an exercise in outsourcing our self-discipline on the trade. Here is how we came to be this way. When trading short term periods, intraday and intraweek, we use a volatility system for alerts to incipient movement. We risk 1 to make 2 and move on when wrong. It works about 50% of the time. it is net profitable. And best of all, positions that are in limbo are closed expeditiously. This is after all a volatility system. No vol, no position. It's been cited here many times in the past. When it is right, it is very right. when it is wrong, you are out. Past posts and a 25 year track record of use bear this out from our active days. The bottom of this post goes into more detail on its use. Portfolio managers at large equity funds who have contributed here anonymously use systems that advise them when being in cash as opposed to long stocks is prudent. What is also known is that funds like these punt gold positions with their discretionary in-house money for fun. …Gold is poised to close above its 12-month moving average for the second straight month. Going back to 1970, the average monthly return for gold following a close above the 12-month moving average is 1.47%. The average monthly return following a close below the 12-month moving average is -0.15%. 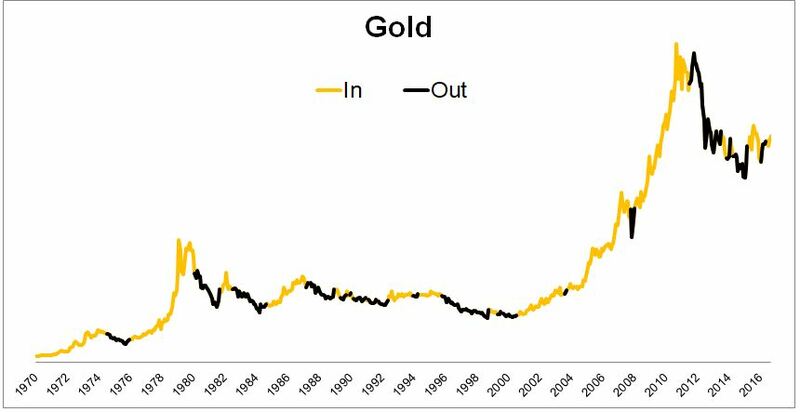 The chart below shows when you would have been invested in gold and when you would have been out. Granted, prior to GLD, this could only have been done with futures contracts, or gold bullion, with the former adding a degree of leverage that I would not have been comfortable with, and the latter adding a degree of paranoia that also would have made me uncomfortable. About Physical vs. ETF: While we agree with the rationale behind GLD vs futures if you are trading and not investing, we feel for multiple reasons the physical gold market is going to open up and become a serious competitor to ETF allocations within 12 months. Specifically, blockchain products are coming, and if properly implemented as a pipeline, owning physical gold not held in trust by a GLD custodian will be as easy as clicking a mouse. You will buy and sell physical Gold that will be yours and verified via the blockchain system. So for us, physical gold now has the benefit of increased liquidity on the horizon, which means increased transactions and exposure. Which ultimately means decentralization of the Gold market from a few large firms to grass roots stackers, owners, and value preservers. We view emerging technologies as putting physical assets in a position to have their true value unlocked. Whether that be the tea farmer in India who can't currently get a loan on his land due to government rules, to Silver whose value is somewhat disconnected from its price. The effect will not be unlike when a private company goes public. Accessibility and liquidity creates safety and increases demand. Owning physical metals is like owning a beneficiary of technology down the road. by optimizing the MA with one factor we back tested greater successes when in trades. Conversely, we were also in less trades. On balance it was a wash. But right now the employed filter says the 12 Month MA has bigger upside than the average if profitable at all. A rare chance to buy close to the level the fund punters did with a statistical chance of greater profits than the 1.47% monthly average generated by the original backtest. 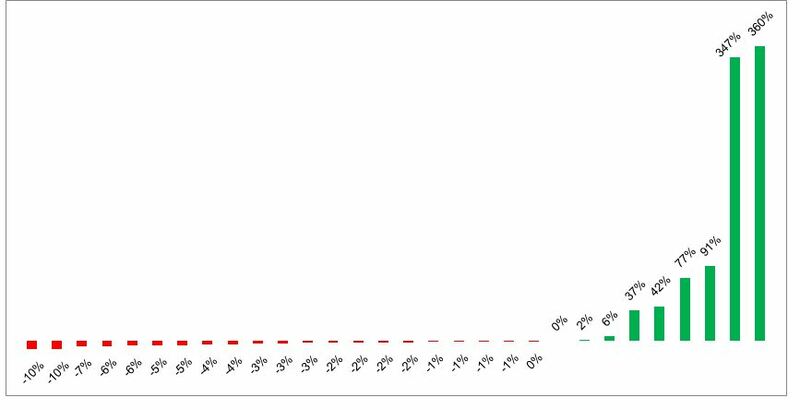 The chart below shows the hypothetical results from each of the 30 exits following an entry (going back to 1970). Using these rules would have resulted in a loss two-thirds of the time. But as you can see, the losses have been relatively shallow, not exceeding 10%, while the gains have been good to extraordinary. Simply put: If we get a VBS signal trigger when $1306 trades, a decision must be made to add, sell, or hold based on the data that comes with the signal. If we get one on a $1260 print, the same must be assessed. We are buying Gold now based on the "Fund Finder" signal with a monthly stop out below the yellow line in that chart above. $1260- we will consider either adding physical, or selling paper Gold for swing trading purposes if the VBS is triggered lower. Bonus: Moor Analytics comes to a similar conclusion from a different perspective. I would note that we broke above a well-formed macro line in the week of 8/7 that came in at 12629. The break above here projects this upward $183 minimum, $501 (+) maximum—the maximum to be attained likely within 9-12 months. This line comes in at 12357 today. I am late to the game on this, but we were only $18 from the original breakout when I mentioned this, and have a lot of room to go in the projection. Time is precious, Price is noisy, Volatility is less so. Alert- One of the prices is breached and closes its bar/ candle beyond that price level. The trigger gives 2 bites at the apple if the trader so desires. About the Author: Vince Lanci has 27 years’ experience trading Commodity Derivatives. Retired from active trading in 2008, Vince now manages personal investments through his Echobay entity. He advises natural resource firms on market risk. He pioneered and executed the Nat Gas EOO arbitrage trade of 2006 to 2008, netting over $90MM for a NYC hedge fund before retiring. Over the years, his expertise and testimony have been requested in energy, precious metals, and derivative fraud cases. Lanci is known for his passion in identifying unfairness in market structure and uneven playing fields. He is a frequent contributor to Zerohedge and Marketslant on such topics. Vince contributes to Bloomberg and Reuters finance articles as well. He continues to lead the Soren K. Group of writers on Marketslant.